There was some decent competition for Cover of the Week. But the winner is X-Men Legacy #4 by series' cover artist Mike Del Mundo. I must admit I'd chosen another cover until I picked up this book to read it. I couldn't believe how I managed to skip over it. As I held it in my hand, it was an instant winner. Mike Del Mundo has been producing some good-looking covers for X-Men Legacy and this one is the best. How it relates to the lead character, Legion, is absolutely perfect. If you've been reading this Marvel NOW! title, you know that well. His mental state and how his power works are definitely puzzles. 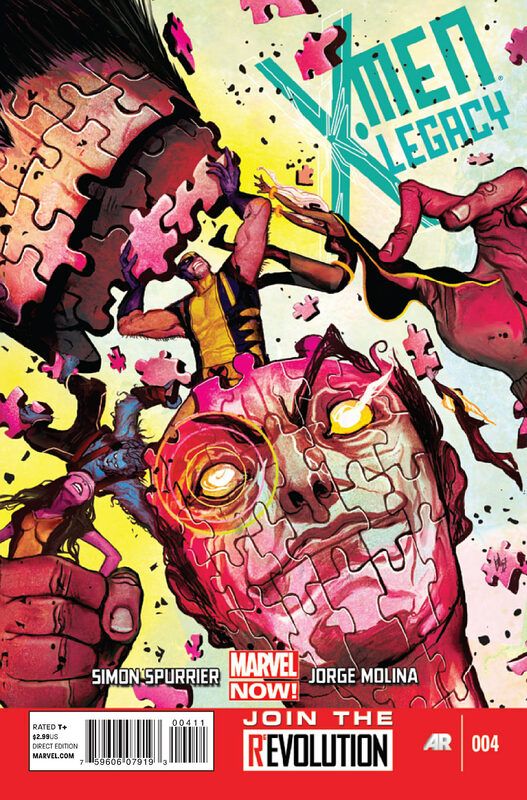 Legion is one of those characters who make for intriguing cover images. An artist can tell a story about a character with the cover image alone. It gets more interesting when the character's mental status is questionable at best. The puzzle pieces flying around are great touches. The interaction with the X-Men caught up in his "craziness" is brilliant. Legion's eyes and that smirk finish it off well. I bet, given the chance, that Del Mundo could create some unique visuals were he the interior artist. Stay tuned for reviews of some of this weeks releases. Thanks for looking. Happy reading to all.